Fogarty Woodlands is an agri-forestry operation located 7 km northeast of downtown Quesnel, producing lumber and a variety of wild berries on a quarter section of land. Silviculture activities include surveys, planting and brushing with treatments to improve growth and value of immature forests including conifer release, spacing, thinning, pruning. 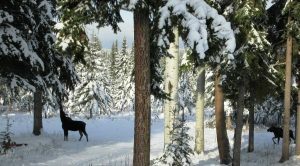 Managing for non-timber resources includes esthetics, recreation, range, wildlife and non-timber products.